A Palestinian hunger striker has entered his twenty-fifth day without food, and is unable to move or stand up. Khader Adnan is a prisoner held by Israeli authorities for the past year without charges or trial.He is protesting the so-called ‘administrative detention’ imposed by Israeli authorities which is used to hold Palestinians indefinitely without ever having a day in court or knowing why they are being held. 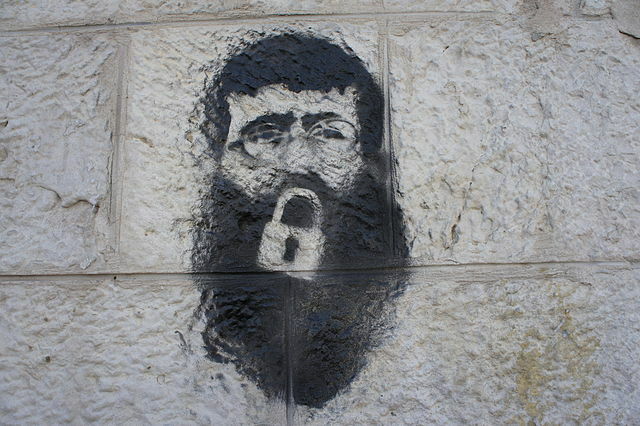 This is the second time that Khader Adnan has gone on an extended hunger strike. While imprisoned previously in 2012, he gained international publicity for a sixty-six day hunger strike. He almost died during that strike, according to medical professionals who treated him, and he has undertaken the current hunger strike with the intention that he will continue until death unless the Israeli authorities and international community address the issue of indefinite detention without charge. For more, KBOO spoke with Maureen Clare Murphy of the Electronic Intifada, who has been following Khader Adnan’s hunger strike.